Not out of the woods yet. Kathy Griffin’s controversial photo of herself holding a bloody, severed head resembling that of President Donald Trump’s is not behind the comedian yet. Although the comedian, 56, has yet to publicly comment on the alleged meeting, she hinted in a tweet on Tuesday, June 27, that she was under federal investigation. The former CNN host’s lawyers revealed via a news conference with her in June that she is being investigated for posting the shocking contentious photo, which surfaced online May 30 alongside a behind-the-scenes YouTube video that has since been removed. 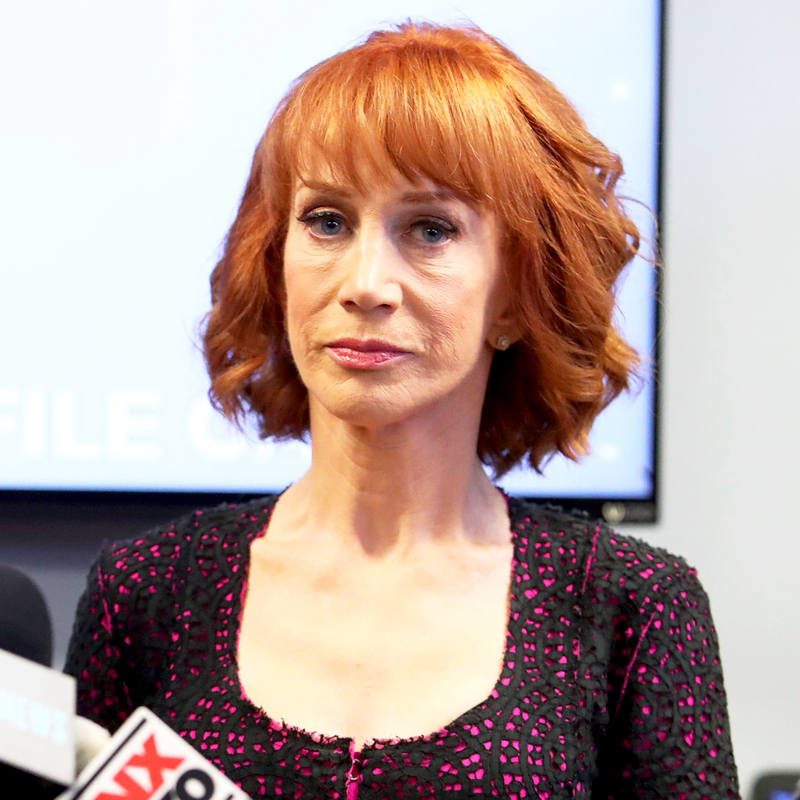 Griffin has since been fired from her CNN New Year’s Eve gig, and has had multiple shows and endorsement deals, including one with toilet footstool company Squatty Potty, canceled. Griffin recently took to Twitter to express her continued disapproval of the president. “POTUS likes to punch down. Whether it’s anchors, US attorneys, or standup comics. Meanwhile, millions are about to lose health insurance,” she wrote in the post on Thursday, June 29. Many politicians across the aisle have spoken out against Griffin’s controversial May photo shoot. “Our politics have become too base, too low, and two vulgar, but Kathy Griffin’s post descends into an even more repugnant and vile territory,” tweeted Mitt Romney, former Republican governor of Massachusetts. Griffin’s former CNN New Year’s Eve Live cohost, Anderson Cooper, also expressed his disapproval. “For the record, I am appalled by the photoshoot Kathy Griffin took part in. It is clearly disgusting and completely inappropriate,” he tweeted at the time. Us Weekly has reached out to Griffin’s lawyer for comment.